The Agribusiness Booster is an innovative instrument that works with pre-growth agri-SMEs in emerging Agri-business Booster (AbB) works on improving Small and Medium Enterprises (SMEs) in the rural agricultural sector and sees innovation and inclusion in the agri-sector as a crucial way to boost rural development. It co-invests seed capital in selected SMEs and provides tailor made business development support to help them grow to business maturity. It focuses on business growth as well as developing scalable models for innovation in agricultural businesses. Once the SMEs have gone through this phase, they are investment ready for social impact and other investors. 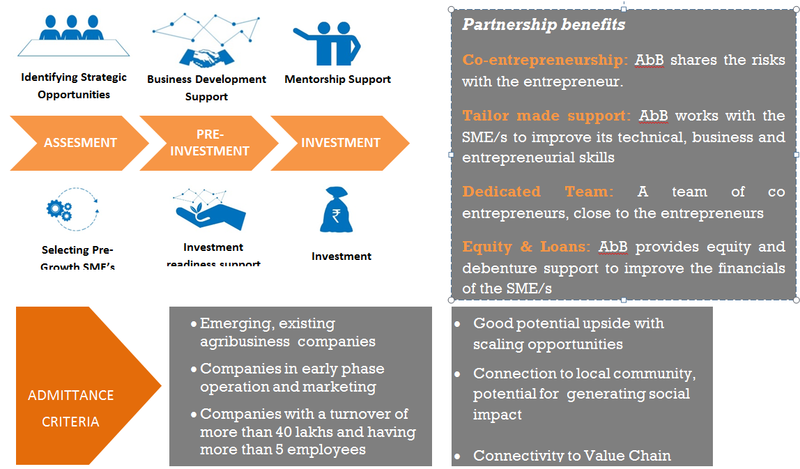 The unique proposition of AbB is that of co-entrepreneurship. Risks are shared with the selected agri-SMEs. The AbB team helps in the professional development of these SMEs, while AbB’s global investment facility provides the needed equity and loan to boost their growth. Both, investment, and costs for business development are shared with the entrepreneur/enterprise and recovered by the added value created in the business. This enforces financial sustainability and smart business thinking. The support process offers a combination of Co-entrepreneurship; Tailor made business development; Equity & Debts; and Smart business thinking. The Agribusiness Booster is an innovative instrument of ICCO Cooperation to work with pre-growth agri SMEs in emerging markets. Through a tailor made set of investments and business development services these companies are grown to business maturity and for social impact.